They have always one of my favorite birds . . . 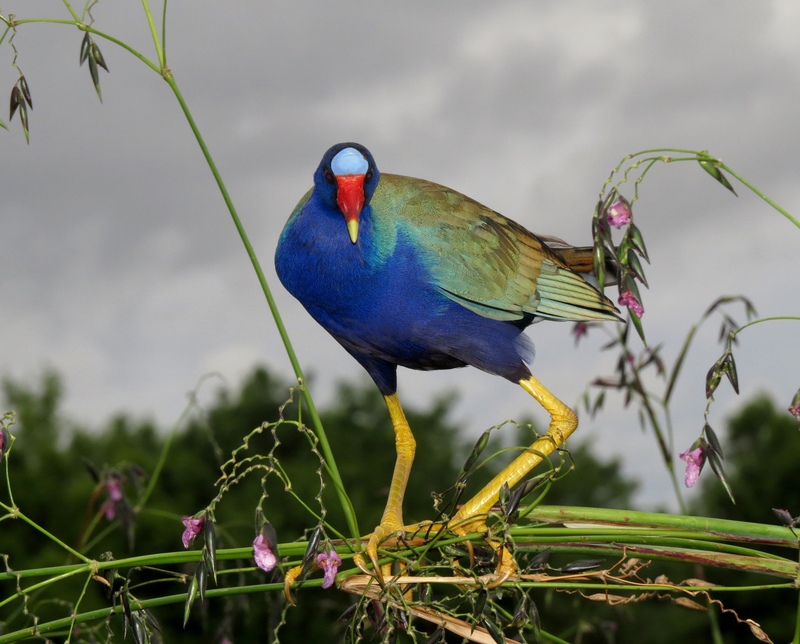 The stunning Purple Gallinules shimmered in the light of my flash on a recent early evening, but my presence didn’t seem to bother them one bit. 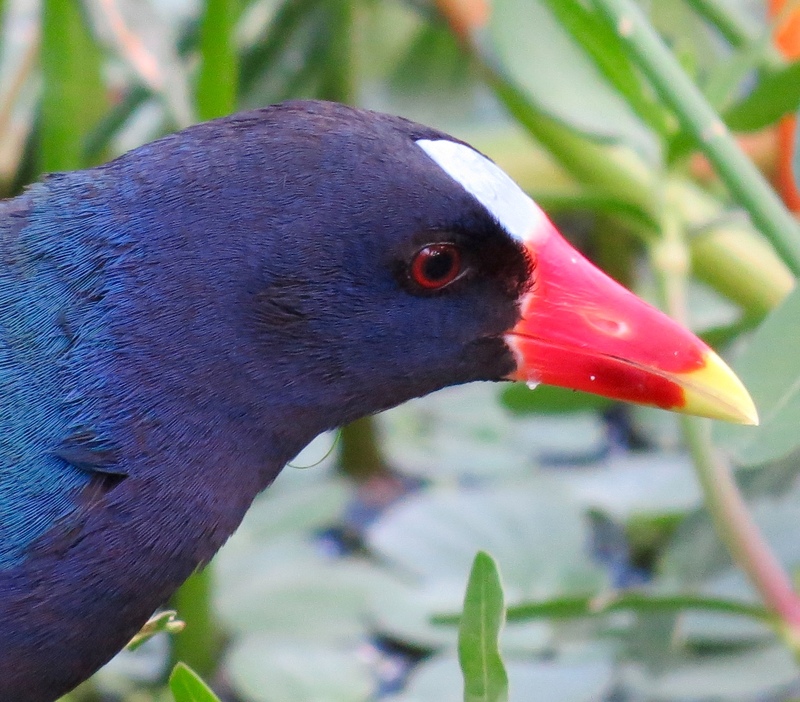 There were no people anywhere around, just the Purple Gallinules and me. I spent many special moments alone with these beauties as they climbed about in the Fireflag plants, munching on those yummy purple blossoms. I find gallinules are often timid or far away on the other side of the pond. It must have been truly special, BJ. And, wow, what great photos of this exquisite bird. When I first started coming to Florida I thought the same thing, Jet. 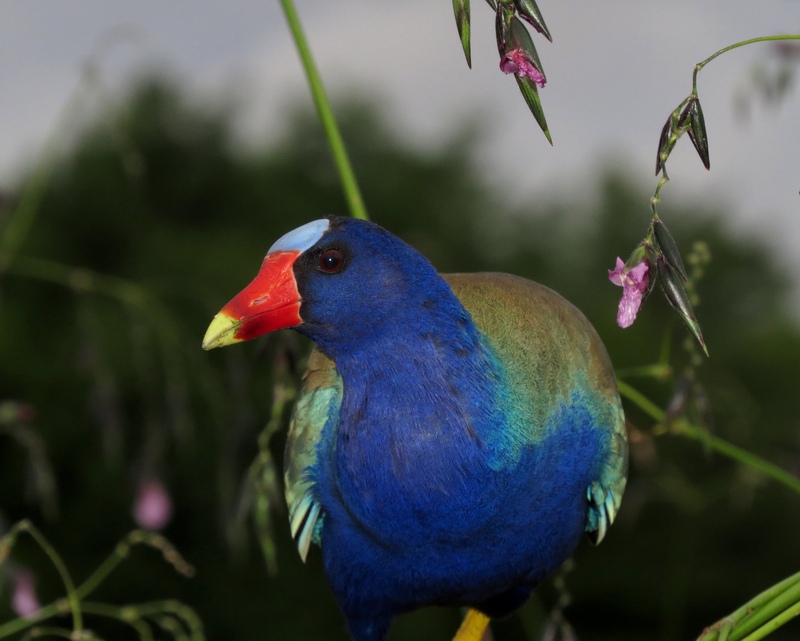 But I’ve since learned how common the Purple Gallinules are in our area, and how visible they are from the walking paths at times of year when certain their favorite plants are in season. We are so lucky!! No humans, just BJ and PG–NICE! Outstanding photos, I’m so happy I became a groupie. Thank so much, H.J. Nice way to phrase it;). I love their colors too! I have never seen gallinule before. Amazingly beautiful. What a magnificent shot, Bj! Amy, I recall also feeling this way when I first saw them. So glad you enjoyed the post! What glorious colour this bird displays, our God is such an amazing artist! Thanks for sharing. So true, AB! – and they really are glorious to see. I never saw one in life, what a beautiful bird. Beautiful captures. Nice to be alone and have that bird as an unknowing companion. Absolutely, Donna! I didn’t want to leave that spot for the longest time…….